Click here for a Ukrainian translation of this page by Anna Makesh, or here for a translation into Estonian by Weronika Pawla, or here for a translation into Uzbek by Sherali Niyazova, or here for a translation into Georgian by Ana Mirilashvili, or here for a translation into Kazakh by Alana Kerimova or here for a translation into Polish by Marek Murawski, or here for a translation in French by Deepak Khanna. Fluent reading is reading in which words are recognized automatically. With automatic word recognition, reading becomes faster, smoother, and more expressive, and students can begin to read silently, which is roughly twice as fast as oral reading. But beginning readers usually do not read fluently; reading is often a word-by-word struggle. How do we help children struggling with slow, painstaking sounding out and blending? Support and encourage them. Effortful decoding is a necessary step to sight recognition. You can say, “I know reading is tough right now, but this is how you learn new words.” Ask students to reread each sentence that requires unusual decoding effort. In general, the fluency formula is this: Read and reread decodable words in connected text. Decode unknown words rather than guessing from context. Reread to master texts. Use text with words children can decode using known correspondences. Use whole, engaging texts to sustain interest. 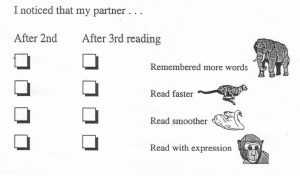 The method of repeated reading has the best track record for improving fluency. Fluency depends on getting many more words into sight vocabulary. When children are decoding words and self-correcting in context, they are adding sight vocabulary. Usually, it only takes about four trials to add a new word. We often restrict reading lessons to “sight reading.” Who could learn a musical instrument by only sight-reading music and never repeating pieces until they could be played in rhythm, up to tempo, with musical expression? In repeated reading, children work on reading as they would work at making music: They continue working with each text until it is fluent. Repeated reading works best with readers who are full alphabetic, i.e., who know how to decode some words. Use a passage of 100 words or so at the instructional level. The text should be decodable, not predictable. The reader might select a favorite from among familiar books. Here are two ways to frame repeated reading. 1. Graph how fast students read while continually checking for reading comprehension. You can quickly get the result with a hand calculator–again, on your phone. Aim for speed, not accuracy. Over repeated readings, speed in WPM will increase and errors will decrease. If you emphasize accuracy, speed falls off. I recommend you get a baseline reading first. 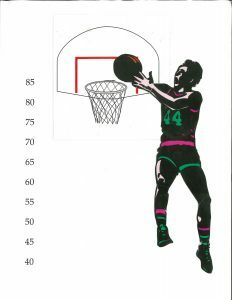 A realistic average goal for a first grade reader is 85 WPM, but adjust the goal to your student’s level–40 WPM may be plenty for very slow readers, and 100 WPM may be an appropriate challenge for others. Laminate your chart, and place a scale in erasable marker to the side. When the goal is reached, raise the bar 5 WPM for the next book or chapter, which requires a new scale on your graph. Keep in mind that as you time each reading, you need to keep track of missed words. Between readings, it is important to support reading in ordinary ways: Ask an open-ended question or make a comment about story events after each reading to keep a meaning focus. Help the student learn the words he or she struggled with, using coverups (have the reader uncover the word slowly with a craft stick to make sense of the spelling) and finishing the sentence to see if the attempt made sense. After identifying the word, have the student reread the sentence. Repeated reading is surprisingly motivating because the reader sees his progress and enjoys his ability to read with speed and expression. They will often ask you if they can read the passage again! 2. Use check sheets for partner readings. With a class of children, pair up readers to respond to one another. Begin by explaining what you’ll be listening for. Model fluent and nonfluent reading. For example, show the difference between smooth and choppy reading. Show how expressive readers make their voices go higher and lower, faster and slower, louder and softer. In each pair, students take turns being the reader and the listener. The reader reads a selection three times. The listener gives a report after the second and third readings. All reports are complimentary. No criticism or advice is allowed. The indirect approach: Voluntary reading. Sustained silent reading (SSR, a.k.a. DEAR, “drop everything and read”) gives children a daily opportunity to read and discover the pleasure of reading. Each student chooses a book or magazine, and the entire class reads for a set period of time each day. SSR has been shown to lead to more positive attitudes toward reading and to gains in reading achievement when peer discussion groups discuss the books they read. When students share their reactions to books with classmates, they get recommendations from peers they take seriously. 1. Everybody reads. Both students and teacher will read something of their own choosing. Any text that keeps the reader interested is acceptable. The teacher reads too. Completing homework assignments, grading papers, and similar activities are discouraged. I recommend teachers read children’s books so they can participate in discussions and give booktalks for their students. 2. There are to be no interruptions during SSR. The word uninterrupted is an essential part of the technique. Interruptions result in loss of comprehension and loss of interest by many students; therefore, questions and comments should be held until the silent reading period has concluded. 3. No one will be asked to report what they have read. It is essential that students recognize SSR is a period of free reading, with the emphasis on reading for enjoyment. Teachers should not require book reports, journal entries, or anything other than free reading. Do not give grades for SSR. One landmark study of SSR* showed that reading gains from SSR depend on setting up discussion groups and other peer interactions around texts. In other words, students need to talk with one another about the books they are reading to motivate a significant increase in reading. With regular opportunities to discuss books, students learn about good books and read more because they want to read what their peers are reading. They usually experience peer pressure to read in order to be able to have something to say to their friends. In this way, reading becomes part of the culture of the classroom. *Manning, C. L., & Manning, M. (1984). What models of recreational reading make a difference? Reading World, 23, 375-380. Book introductions help children make informed decisions about what they want to read. For an effective booktalk, choose a book you like. Show the illustrations to the students. Give a brief talk, hitting the high points: the setting, characters, and the inciting incident leading to the problem or goal. Do not get into the plot, and especially not the resolution! If there is no clear plot, ask a have-you-ever question (e.g., Have you ever been afraid of the dark?) and relate the question to the book. Good booktalks often feature some oral reading, e.g., of a suspenseful part.